From Friday 15 February 2019 until Friday 3 January 2020: Enjoy 10 % off! From Friday 15 February 2019 until Friday 3 January 2020: Enjoy 12 % off! From Friday 15 February 2019 until Friday 3 January 2020: Enjoy 15 % off! From Friday 15 February 2019 until Friday 3 January 2020: Enjoy 21 % off! From Friday 15 February 2019 until Friday 3 January 2020: Enjoy 20 % off! From Friday 15 February 2019 until Friday 3 January 2020: Enjoy 30 % off! The Sofitel Marrakech Palais Impérial hotel is a magnificent Moorish palace set in the middle of luxurious gardens of palm trees and bougainvilleas. The immense columns and sculpted ceilings, traditional zelliges, carpets and artwork, are a beautiful invitation to succumb to the combined charms of Eastern hospitality and the excellence of the French lifestyle. 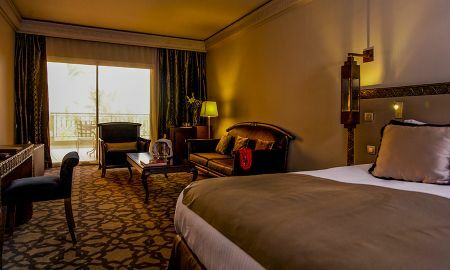 Warm and comfortable, the 207 rooms and suites of Sofitel Marrakech Palais hotel assure you an unforgettable stay between splendid landscapes and pleasant views to the gardens, swimming pools and mountains. Elegantly combining Moroccan inspirations and international flavours, the restaurants of the hotel serve a rich and delicious cuisine in a luxurious atmosphere. For a little gourmet break, a cocktail or a glass of champagne, visit the ‘‘Lawrence Bar'' or ‘‘Bar Darkum'', two ideal and inevitable places to begin or conclude your evening party in Marrakech. The So Lounge offers live shows every night, in harmony with the magic of Marrakech. Access to the So Lounge is free of charge for hotel guests until midnight, except for weekends and special events. Oriental fitness and sensual pleasure: the Spa, hammam, sauna, indoor and outdoor heated swimming pools of the hotel will awaken your senses and soothe your spirit. Pamper yourself next to the Ultimate Pool. Refresh yourself while admiring the beauty of the hotel gardens and enjoy panoramic views of the Atlas in the distance. Located in the heart of the most dynamic residential neighbourhood of Hivernage, Sofitel Palais Imperial hotel is close by the well-known square of Jamaa El Fna and the Medina. At only 15 minutes from the airport, the hotel offers a direct access to the city-centre. The credit card used at the moment of the booking must be presented to the receptionist upon arrival.